Annapurna Base Camp trekking in Nepal passes through a variety of terrains. Particularly, this trek starts from lowland, dense rhododendron forests, and rice terraces offering an outstanding view of the mountains. Further, you keep on seeing each day until you reach the base of the tenth highest mountain in the world. You will pass right through the center of Annapurna range, a magnificent arena of staggering scale. Furthermore, this is a sacred land of native Gurung people. 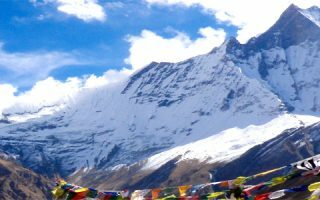 In many ways, Annapurna Base Camp trek is a lovely and intense and a direct route into the heart of the Himalayas trekking through best of Nepal’s diversity. This trek provides an opportunity for capturing the view of gigantic Himalayan peaks filling the skyline. Arrive in Kathmandu. Meeting and assistance at the airport and transfer to the hotel. Overnight at the hotel in Kathmandu. On the top of the hill west of Kathmandu value is one of the popular and instantly recognizable symbols of Nepal. It is also referred to as “Monkey Temple” by many tourists because of the large tribes of monkeys that guards the hill. Legends say after the Bodhisattva Manjushri drained the water from the lake revealing the Kathmandu valley, the lotus one the island of the lake was transformed into the hillock, and the blazing light from the lotus became the statue. Patan also known as Lalitpur is the second largest city in the valley. Patan has a long Buddhist influence and the four corners of the city are marked by Stupas said to have been created by great Buddhist emperor around 250 BC. The Durbar Square is closely packed with temples, and with far more concentration of architecture than anywhere around the valley. Approx. 200 kms from Kathmandu Pokhara enjoys a mild climate, clean air, reflection of snow-capped mountains on the sheltered lake. Its relaxed atmosphere is pleasantly removed from the hectic hustle and bustle of Kathmandu. Lakeside Pokhara is a traveler’s oasis. The tourist area of Lakeside, stretched out along the southeast shore of the valley’s largest lake. Lakeside has its own charm especially in the evenings when darkness hides the clutter and shops are lit up like a Christmas trees. Foothills separate Pokhara from the Himalayas. Upon arrival in Pokhara transfer to the hotel. Evening stroll around Phewa Lake. Overnight at the hotel in Pokhara. After breakfast, drive to Phedi (15 min). From here the train ascends through the woody wooded Dhampus ridge, climbing steeply to Pothana.From Pothana you will be rewarded with fine views of mountains including Machapuchare, the “Fishtail” mountain. Overnight at the local lodge/tea house in Pothana. From Pothana today the trail descends through thicker rhododendron forest and cultivated hillsides around the village of Tolka (1700m) before reaching Landrung, a substantial Gurung village with great views of Annapurna South. Overnight at the local lodge/tea house in Landrung. From Landrung the trail follows Modi Khola upwards crossing the river at New Bridge (1340m) and climbing very steeply above Jhinu Danda to Chhomrong. Chhomrong is a beautiful village located on the lap of the giant Annapurna massive. Overnight at the local lodge/tea house in Chhomrong. The route above Chhomrong is spectacular and simple. The trek now enters the upper Modi Khola valley. Next, we pass through a beautiful forest to Kuldihar followed by an easy downhill walk to Bamboo the route offers high altitude landscapes with the Annapurna Range in view most of the times. Overnight at the local lodge/tea house in Bamboo Lodge. The trail climbs through Bamboo, then rhododendron forests to Doban at 2540m and to Machapuchre Base Camp. Overnight at the local lodge/tea house in Machhapuchhare Base Camp. Early morning, excursion to Annapurna Base Camp. The vegetation disappears on our way to ABC and the path widens as we enter the Annapurna sanctuary. From here, we get sensational views of the near-vertical south face of Annapurna towering above us. The sanctuary boasts of a dynamic view without anything impeding the 360-degree panorama. From the Annapurna base camp, we again get to savor mesmerizing views of the Machhapuchhre, Annapurna South, Annapurna I, Hiunchuli and other peaks. At evening trek down to Dovan (7 hrs walk). Overnight at the local lodge/ tea house in Dovan. After breakfast, trek from Dovan to Chhomrong (6 hrs walk). The trek is downhill, so it shouldn’t be very difficult. Besides, we will always have the company of the extraordinary landscape to cheer us up. Overnight at a local guest house/ tea house in Chhomrong. After breakfast, trek from Chhomrong to a Gurung village of Ghandrung (7 hrs walk). Ghandrung is a huge Gurung village and is second largest Gurung settlement in Nepal and is a confusing cluster of closely spaced, slate roofed houses. There are neatly terraced fields both above and below the town. Overnight at a local guest house/ tea house in Ghandrung. After breakfast, walk down to Nayapul (4.5 hrs walk). After a lunch, drive back to Pokhara (1 hrs drive). Later, the tour of Pokhara’s best-known temple BindeBasini. You will find the pleasant, shady setting very impressive. This temple is dedicated to lord Durga and is very famous among Hindus. Visit Devi Fall also known as Patale Chango. This fall is the outflow of from Phewa lake and at Davi Falls it suddenly drops down into the hole in the ground and disappears. The name came from the tale about a tourist named David who disappeared down the hole, taking his girlfriend with him! Visit Gupteshwor cave, the longest cave in Nepal. There is a temple of Hindu god within the cave which makes this a sacred cave. Later, one-hour boating on Fewa lake. Overnight at the hotel in Pokhara. After breakfast, transfer to the airport and fly back to Kathmandu (25 min). Upon arrival in Kathmandu, transfer to the hotel. Upon arrival in Kathmandu, transfer to your hotel. Evening, transfer to an authentic Nepali restaurant for dinner with cultural shows. This is one of the wonderful experiences to taste typical Nepali food which we call “Dal Baht” with lentils. You will be surprised by the variety of Nepalese dishes that will keep on coming. The server with a gentle smile on their face will name you every item in Nepali as well as in the English language before serving you. Along with the food, you will be kept entertained with typical Nepali folk shows. You will get a chance to see the dance performance of different ethnic groups of Nepal in their unique cultural uniform. After dinner, transfer back to the hotel. Overnight at the hotel in Kathmandu. Free till departure. Transfer to the airport in time to connect your onward flight. How To Pick The Right Nepal Tour package? Luxury Tours in Nepal | What Should You Expect? Bhutan Tour Packages | Did You Know? Have You Considered Luxury Tour Package in Nepal? Hey! Are You Looking Forward to The Best Nepal Trekking package? Which Trekking Packages in Nepal Will You Prefer? What’s So Trendy About Nepal, Bhutan, And Tibet Travel That Everyone Goes Crazy Over It? Why Travel Is Required For Your Mind and Body? Which Nepal Trip Package Allures You? Why is Langtang Trek Alluring? Do you Wish to Enjoy Luxury Tour Package in Nepal? Who Does Not Want to Experience Safe Trekking in Nepal? Are you looking for some travel in Nepal? Have You Been to “The Paradise on Earth”? What Makes Grand Nepal Round Trip One of the Best Nepal Tour Package? Have You Visited These Religious Sites in Kathmandu Valley? Nepal Trekking Destination in Nepal is Best During June, July, and August? Have You Tried This Adventure Activity in Nepal? Why must you use a travel agent for Nepal travel? Is Nepal Expensive to Travel?